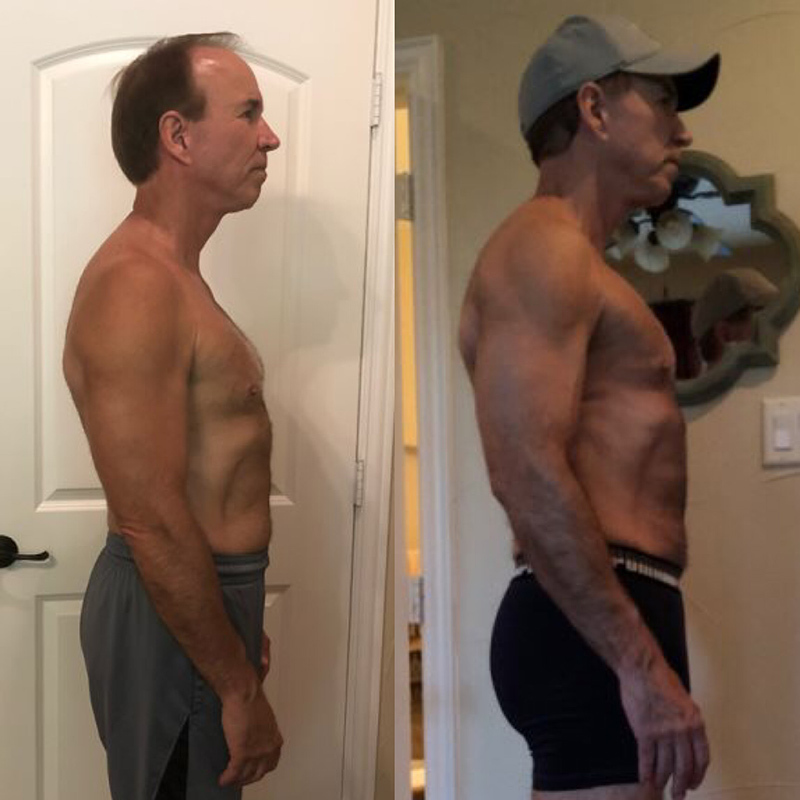 Randy McCoy, AKA Dad, was very inspired by the results Mark Diaz was able to achieve (Click here to check out Mark’s transformation). He made the decision that after his summer travel plans came to a close, that he wanted to dedicate 12 weeks to getting into the best possible aesthetic shape. His results were very impressive. This article will cover what we did to achieve this. Randy has always lifted weights and is no stranger to the weight room. After an assessment of what he was doing, his program lacked structure. He was overtraining certain body parts, neglecting others, and there was a lack of planning for progressions in weight or total training volume. He was doing a lot of cardio because he liked to maintain a lean appearance, so he was doing a high volume of running and walking to make up for any poor dietary habits. On the diet front, he was eating generally very healthy, but his caloric intake was very low most days, aside from some high calorie out-to-eat meals a few times per week. I had him get baseline numbers from DexaFit. Results are shown below. I structured his training to have four core workouts with an option to do one or two additional workouts. Here is a sample split using the option for an additional Chest/Shoulder Day. We actually began by reducing his cardio volume. He was doing too much cardio compared to his caloric intake. To make sure he was able to have enough nutrition to build new muscle tissue, I needed to reduce his cardio in both duration and intensity. I didn’t want to eliminate it completely because he had adapted to doing a lot. 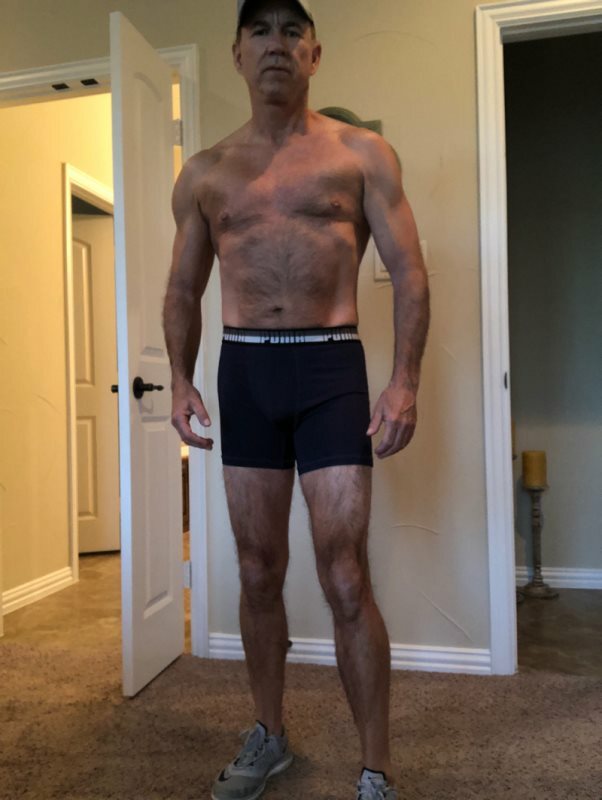 He likely would’ve experienced a body fat gain had we reduced it completely, which would have required me to over diet him toward the end of the 12 weeks to get the look we were after. Our cardio plan to begin with and for the first eight weeks of the program is detailed below. Four Days of Steady State Cardio. We’ll start with 35 minutes per session. You can do whatever modality you prefer, but let’s aim to keep your heart rate between 135bpm and 145bpm. I’d like these to be either fasted or post workout. One Day of Interval Cardio – You can choose which machine you use. I personally prefer a spin bike for this so I can really dig into the sprints! Five-minute warm up. Then five rounds of: 15 second all out sprint, 90 second cruise. Then do a five-minute steady state low-moderate intensity cruise, using the last two minutes as a cool down. In the final four weeks, we increased the cardio to 45 minutes per day and exchanged the interval cardio for an additional day of steady state cardio. 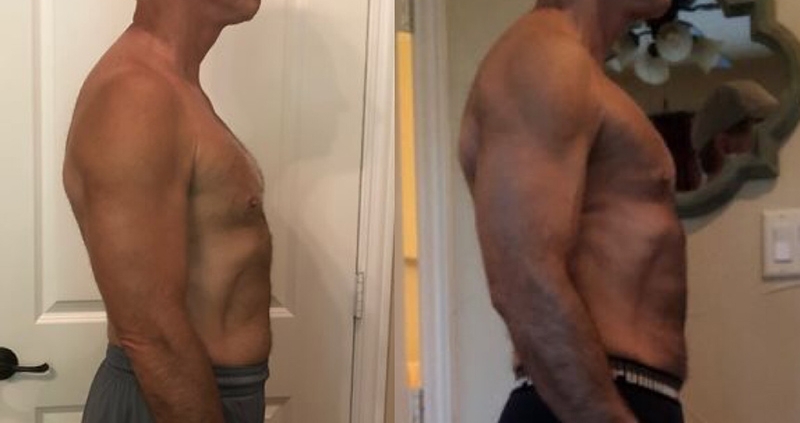 At this point, his calories were very low and I wanted to protect his muscle mass as much as possible and optimize his recovery from training, so I removed the HIIT and kept with fat burning focused cardio. Our supplement plan was a three-part plan consisting of General Health, Muscle Building, and Fat Loss. For general health, he took a men’s multivitamin and glutamine along with a few other general health supplements he had already been taking. For muscle building efforts, we utilized Creatine (in the form of Creatine HCL), EAAs consumed during weight training, BCAAs consumed during cardio, Whey Protein Isolate consumed as part of his meal plan, and a pre-workout formula. For Fat Loss, we used a green tea based thermogenic (Clean Burn) and CLA. I was very impressed that we were able to gain lean muscle mass during this process. I was realistically hoping, at best, to maintain his lean muscle while getting rid of body fat. I attribute this success to our training structure, diet strategy, and supplement planning but also the fact that I believe he had likely experienced atrophy over the years. I think our program optimization likely regained lost muscle mass and did a good job of maintaining those lost gains while shedding the nearly seven pounds of pure fat. These results are difficult to achieve at any age, but Randy’s age make these results even more outstanding. I also need to point out that his adherence to the program was very good. Other than a few travel situations where the diet adherence had to stray some or gym access was limited, his discipline and effort are what made the plan come to life and create real results.